Another great response on the Red line blue line challenge for this week! Super cool to see all the feedback both on social media and a few more in depth on our forums! Thanks to everyone who contributed. I want to point out before we start the breakdown on this weeks challenge, these conversations are IMPORTANT ones to have. There’s not always a one size fits all approach to line choice. 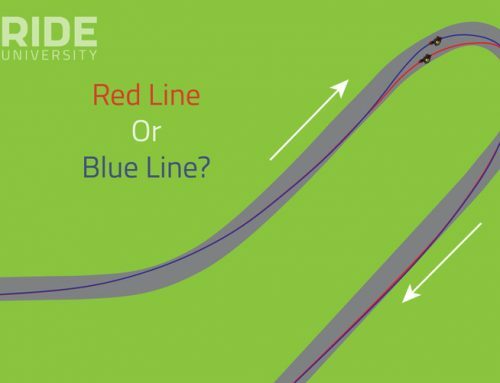 One of the coolest parts about these first two challenges has been that in reading the comments on social media – everyone at Ride University has been conversing about different scenarios and considering not just what line is BETTER, but WHY. Which is huge. Understanding the WHY in all of this should be our goal at the end of the day! Now on with the breakdown of this week’s challenge! BOTH lines are 100% correct this time around – according to which type of motorcycle you’re on. No changes except to point out that what we have defined here is a range of lines… the red and the blue being the extremes for this turn. The purple area will be an infinite amount of varying lines that fall within this range. 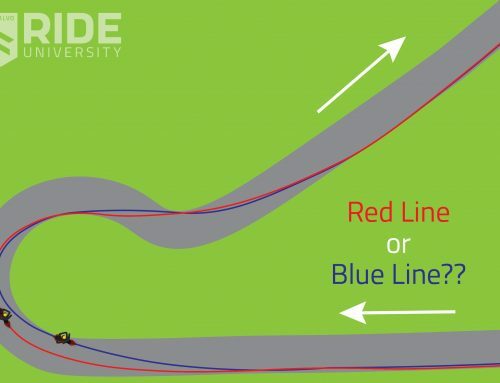 These lines will depend on how much acceleration your motorcycle is capable of and how that will ultimately impact the lean angle you carry exiting the turn. Red line is going to be your typical “big bike” line that I would take on a 1000cc motorcycle. 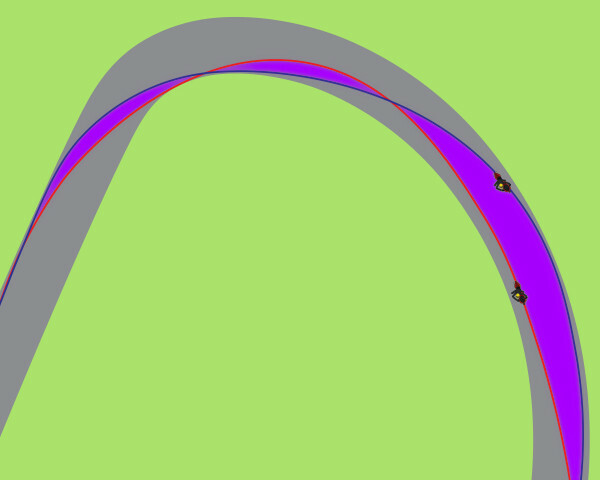 Even on a 600cc motorcycle I’m going to favor the red line as well – perhaps falling just a bit inside the purple area. All because (and a lot of you nailed this in the comments) we need to get the bike STOOD UP and take away lean angle before we accelerate. Now – the BLUE line however this week was ALSO correct. This line is going to be your typical small displacement motorcycle (also something a LOT of people nailed in the comments), and with these bikes the biggest factor is always our lack of acceleration. Our blue line rider this week WAS in fact on a 300cc small-sportbike and came into the turn, tipping in slightly later than red line rider and apexing later. 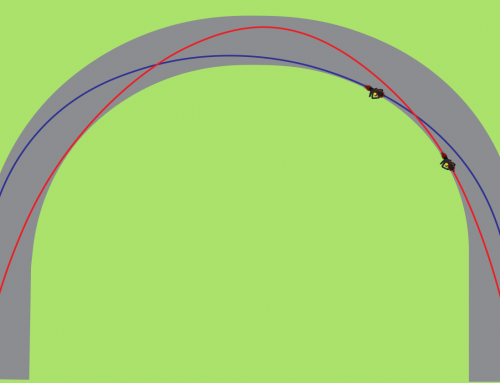 What this allows blue line to do though is carry more roll speed through the middle of the turn. From there, blue can actually (because he’s on a small displacement bike) start to open the throttle with bit more lean angle and finish turning under acceleration. It’s also important to note that blue rider could have in fact pushed their line slightly more towards what the red line rider is doing. 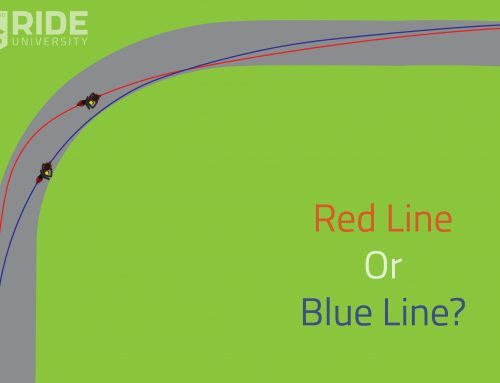 It will still ultimately be the safer way around for the small displacement bike and as not everyone is going after pure speed or outright lap times at the track, this approach will work, but they’re going to really struggle getting out of the turn once they lose the momentum gained by running the more sweeping (blue line). What you notice that blue line rider this week did NOT do, was run the bike to the extreme latest point possible before turning in. 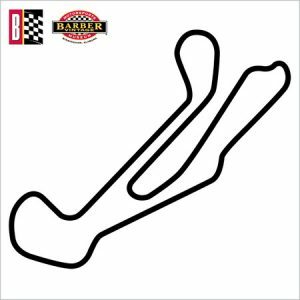 They’re still tipping into the corner relatively early (based on the shape of the corner), and using an appropriate amount of trail baking into the turn before they pick up the throttle. 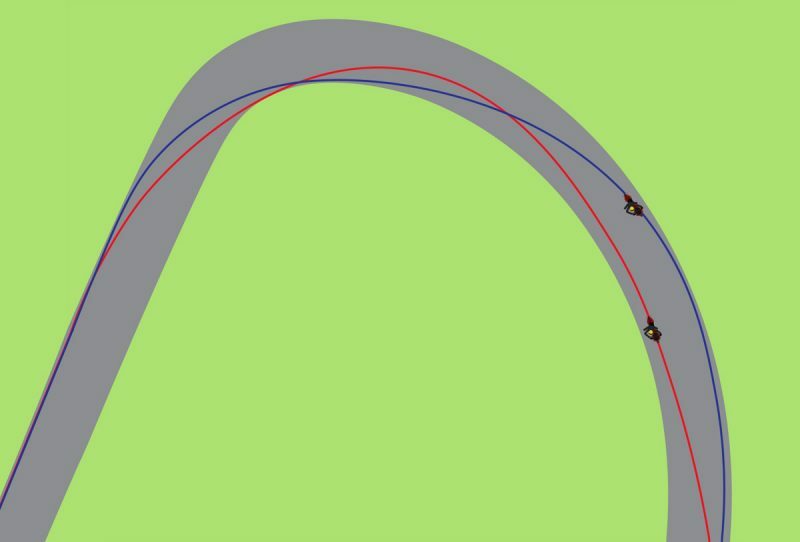 The SPEED=RADIUS concept we teach at our events and in the online courses will keep their line tightening as they continue to slow all the way to their apex of the turn. So again to recap – both riders were spot on this week, depending on their scenario and circumstances. 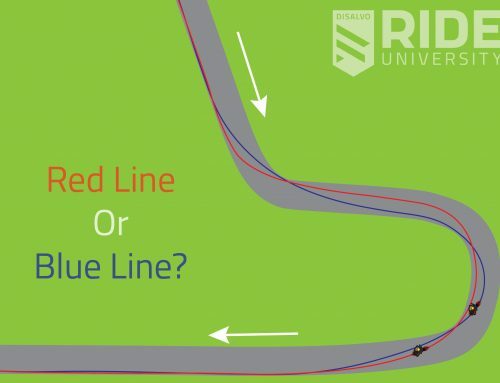 This is a concept we cover in online courses – there’s not always a “right” line (that everyone must adhere to), but what we’re shooting for is the BEST line for you, that still stays within the broader line-choice concepts we talk about here at Ride University. The lesson in the link above that discusses this concept has been opened up to the public (no signup required), so make sure to share it with your friends the next time they try to tell you you’re not taking the “right” line. Stay tuned for next week’s image. I will promise you this – there will be a DEFINITIVE winner of the red/blue challenge for next week!